It’s reasonable to assume that this adaptation of Patrick Ness’ lauded coming-of-age novel would be targeted at those of the same tender age as the boy at its heart. But, make no mistake; it packs an emotional punch that is universal. And of a purity that feels rare. It being a depiction of a tweenager and his mum facing up to the fact she isn’t going to be around to see him reach adulthood should, perhaps, alert the viewer to the touch-sensitivity of the subject matter. But the fantastical way it’s told, and the skilfully mature performance by Lewis MacDougall as the young protagonist, deliver what could have been a saccharine message with deft creativity and a searingly authentic honesty. As Mum’s (Felicity Jones) increasingly desperate cancer treatments fail to arrest her worsening condition, Conor is visited by the monster in the tree outside his bedroom window. In fact, the monster is the tree, who simply uproots himself and wanders over to Conor’s window for a chat, voiced by the weightily throated Liam Neeson. 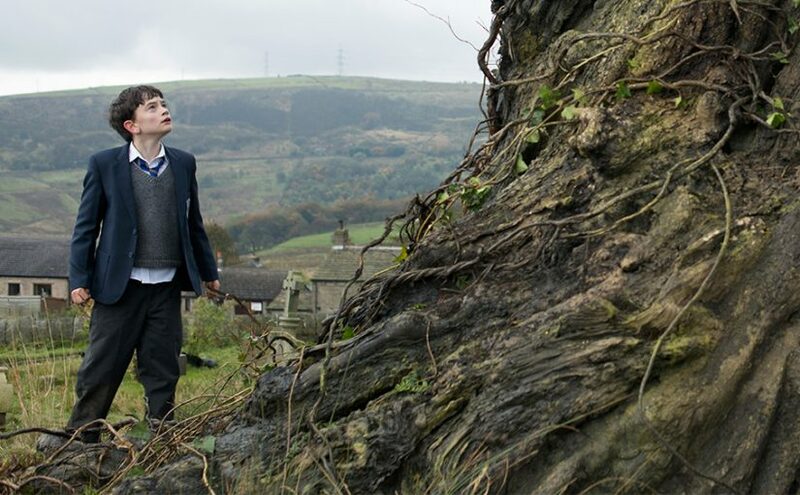 So A Monster Calls …but with good intention. He’s here to fortify the lonely adolescent, bullied at school and now on the cusp of an event he can’t comprehend the magnitude of, with stories selected especially for him. Stories that have solace, support and strength embedded deeply within. As long as Conor can unearth the moral rooted in each. Animating the tales in elegant, nostalgic, hand-drawn style means the youngster within us is being addressed. We feel transported back to childhood ourselves by the simplicity of the cartoon medium, comforted by, and seeking consolation in, each compassionate fairy tale. As these mythic fictions sink in, the cumulative lesson is that there is a story in each of us, the ultimate one to be told being Conor’s own. For this is what takes most courage; to tell one’s own tale honestly; to express your own feelings. Even if your world is collapsing around you. The film’s success is, in large part, down to the fact that MacDougall’s sensitive performance is broad and refined enough to support the weight of such material. Such that it never feels portentous, only poignant. But it’s also hard to think of supporting players better suited to bring his fractured family to life. Woman of the moment Jones (Rogue One (2016)) embodies just the right balance of down-to-earth charm and a protective, defensive mask of ‘bravery’. Toby Kebbel, as the estranged Dad trying to connect with a son’s life he’s now mostly absent from, gives a touching performance of well-meaning but misguided pragmatism. And Sigourney Weaver mines her authoritarian aloofness with great effect, all the more impactful when her own resolve inevitably crumbles. This is a delicately packaged dealing with the ultimate taboo, adroitly speaking to children, and, via that directness, everyone’s inner child. Facing up to the very worst blow life can land is ultimately the one thing that unifies us all. It might not fit the mould of the traditional “family film”. But this is, refreshingly …truly… a film for the whole family. Heartrending, poetic, marrying the most gut-wrenching emotion with the sweetest of benevolent morals. Treasure the present.